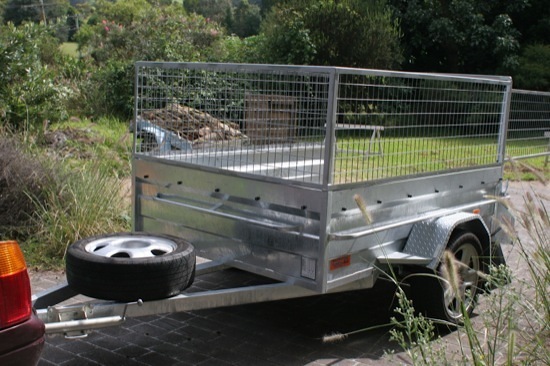 A trailer is an invaluable addition to a homestead. It turns the family car into a ute (pickup truck if you live outside Australia! ), without the expense of buying and maintaining an additional vehicle. This is a list of what I think are the ideal features for the ultimate homestead trailer. You probably won’t find a trailer with every feature on the list, and your needs won’t be quite the same as mine, but hopefully you’ll find this a handy starting point. 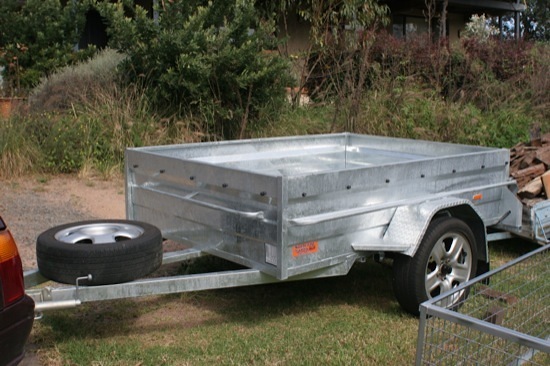 I like a steel, hot-dipped galvanised trailer frame and body – it’s light, strong and durable. Non-galvanised trailers rust in our seaside environment. Timber floors and sides are OK, but they’re heavier and they rot if they trailer is exposed to the elements. A single axle (i.e. 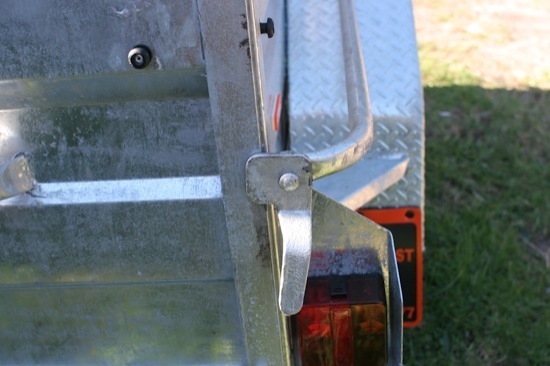 two wheels) is best here in NSW – registration costs are higher for trailers with dual axles (i.e. four wheels), and many tips charge commercial rates instead of the lower residential rates for multi-axle trailers. One axle is good for carrying loads up to 750 kg (provided the trailer is built for that!) – if you need to carry more, you may have to step up to dual axles. I find a 1.8m x 1.2m (6’x4′) tray a little small. I went for a 2.0m x 1.5m (7’x5′) trailer – that 30% additional floor area and slightly more length have come in handy several times already. High sides, around 50 cm (20 inches) give you a nice deep tray, great for hauling large quantities of loose materials like mulch, compost, manure, etc. A removable cage is invaluable. My trailer’s cage height is perfect for me, at 60 cm (24 inches). On top of the 50 cm tray, that gives plenty of height for carrying animals, tying off loads, containing loose firewood, etc. I bought the optional heavy duty weatherproof cover for the cage as well. We plan to use the trailer when we go on holidays (in fact, Megan and the kids have taken the trailer on a holiday with her Dad this week! ), and there will be times when you need to move stuff in the rain without getting it wet. A cover can also be good when hauling animals, although you have to be careful they have ventilation so it doesn’t turn into a hotbox. 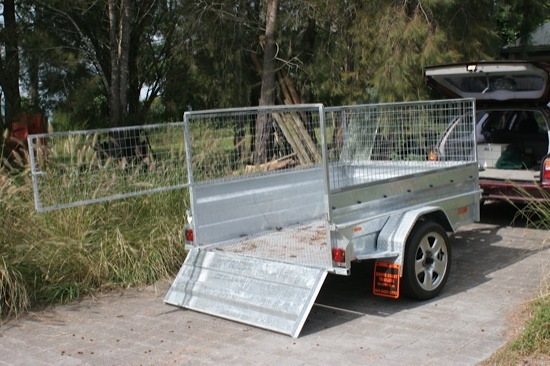 Ideally, the trailer should be weatherproof when the cover is on the cage. Our trailer wasn’t, as the welds around the edge weren’t continuous and water could get in through the sides. It was easy to fix with a bit of silicone, though. 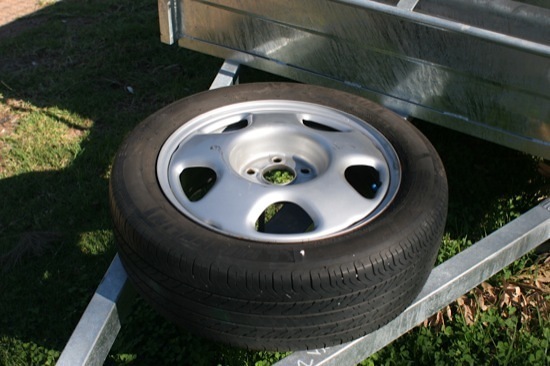 If possible, get wheels, rims and stud pattern on the trailer that match the car you plan to tow with the most. This gives you more options if you get a flat while out and about. It’s good to have a spare wheel mounted on the trailer’s draw bar, too. We did specify wheels to match our car with the trailer, but unfortunately the manufacturer supplied it with low-profile tyres and rims. At least the stud patterns match. Ideally the wheel arches should be strong enough to stand on when you’re accessing or tying down your load. It’s good to have additional step points around the trailer as well. 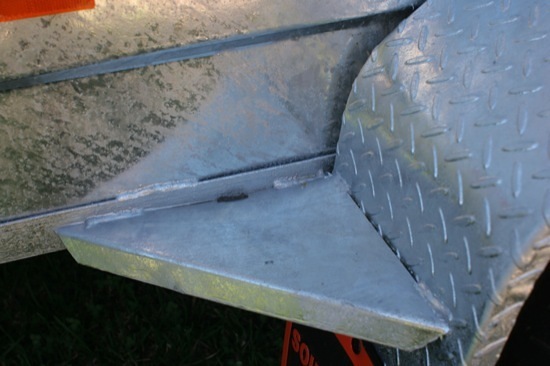 Tie-down rails on all four sides of the trailer make securing your load much easier. They need to be heavy duty, so you can really pull ropes tight. A checkerplate floor is better than a smooth floor. The raised bumps will reduce wear on the floor, and also provide grip when you’re standing in it. It’s still easy to sweep out, though. The tailgate should be full-width. This makes it easier to load things that are the full width of the trailer, and also much easier to clean out. A removable tailgate is a handy feature. Mine attaches on pins and has a plug in the wire for the number plate light, making it very quick and easy to remove. It could be improved with some kind of lock on the pins – I’ve accidentally pulled it right off when opening it a couple of times now. Unlike mine, the pins should be unequal lengths so you can line them up one at a time to put the tailgate back on. It’s a bugger trying to get mine back on when you’re on the side of the road, in the dark, after accidentally pulling it off! My tailgate hits the ground when it’s lowered, which is a bit of a hassle. It would be better if it hung freely, but I’d rather have the additional tray depth than sacrifice it for a free-hanging tailgate. 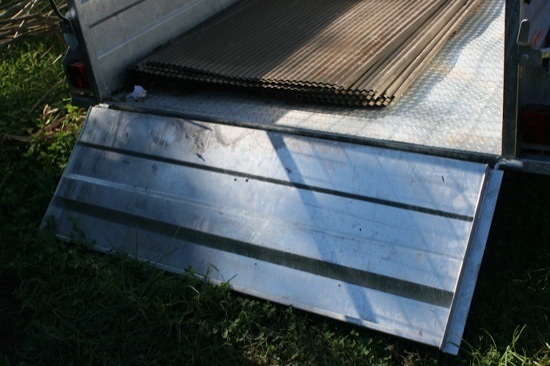 Check that the frame of your trailer and its cage don’t have any hollow or concave areas that will collect water (e.g. a tube that’s open at the top, and welded flat to the frame at the bottom). These will collect water and debris and rust out over time. 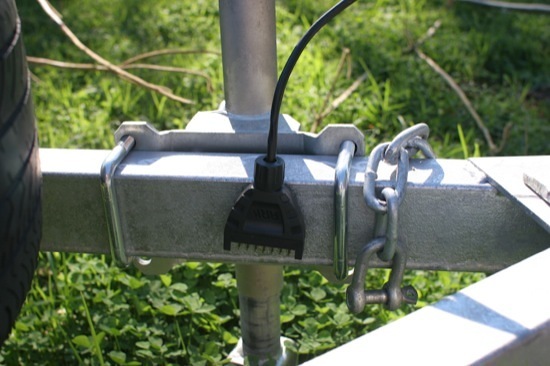 The electricals on the trailer should generally run inside the frame, or in conduit next to the frame. There should not be wires dangling where they might get damaged by a stray stick, or pinched in a moving part. 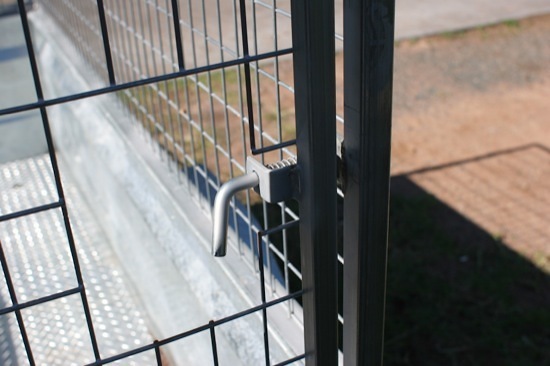 Tailgate and cage latches should be heavy duty, secure, easily-operated, and lockable. 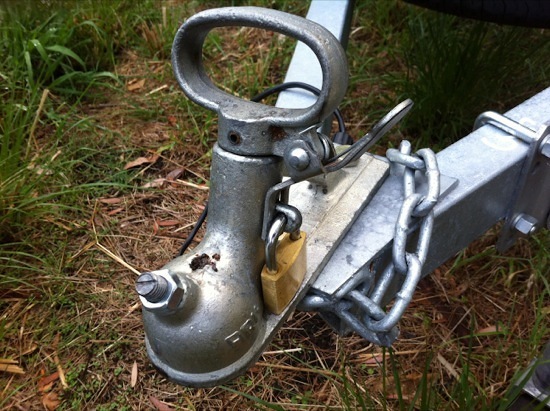 My latches aren’t lockable, which means I need to carry chains and padlocks if I want to secure the trailer. 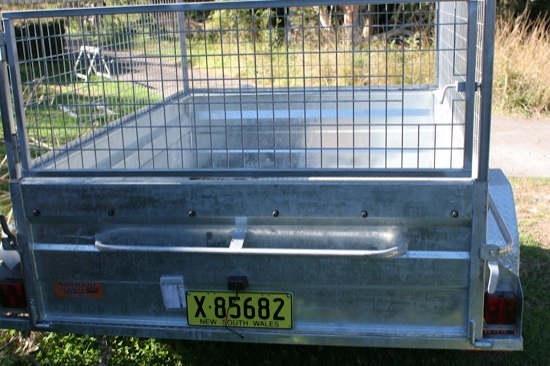 All screws, bolts and fittings on the trailer should be stainless steel or galvanised. Some of the screws that were used on my trailer aren’t, and they’re already beginning to rust. They’ll be easy enough to replace, but the manufacturer should have used the right ones to begin with. The electrical connection on my trailer has a magnet on the back of it. What a great idea! 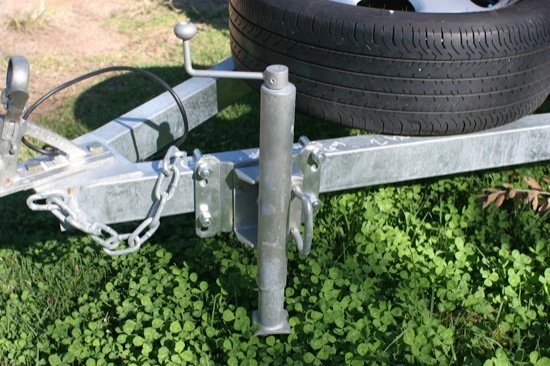 When not in use, the plug sticks to the frame of the trailer, keeping it off the ground and out of the way. The bolts that hold the cage on my trailer came with nuts that are up inside the folded tray edge, where you can’t get a socket or adjustable wrench around them. It was a real job to get the cage off that first time! The designer didn’t put much thought into that little detail. I replaced them with big wing nuts that catch against the tray edge, making it much easier to attach and remove the cage. 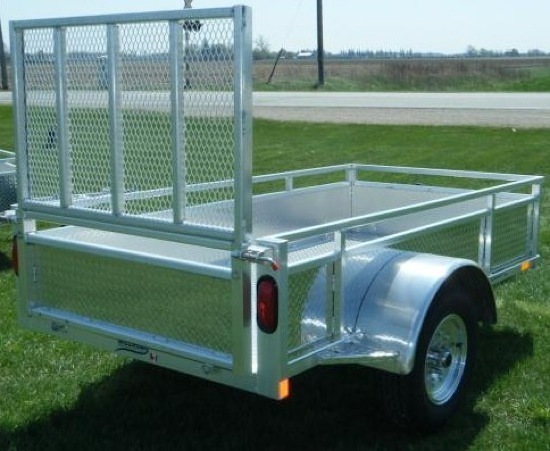 Some trailers have lights that protrude from the side or rear of the trailer, and these often get broken when reversing or maneuvering the trailer. Recessed or protected lights are a good idea. My towing hitch can be locked with a padlock to stop anybody from being able to attach it to their car. You can also lock it onto your car, preventing anybody from removing it. If you have any tips on choosing or modifying a trailer for the homestead, please leave them below!